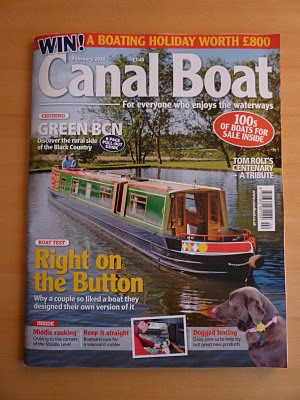 The February edition of Canal Boat has been in the shops a week, but we had no post for several days last week because of the snow, so I've only just got my copy. It contains my test of Button End, a Goldsbrough boat. The test was done just a couple of days before we set off on our three week trip last September, and we had weather we can now only dream of: sunshine and warmth. Button End is based on a previous Goldsbrough boat, Footsie 100. Imagine my surprise when just a couple of days into our September trip, we passed Footsie 100 moored just south of Stoke. 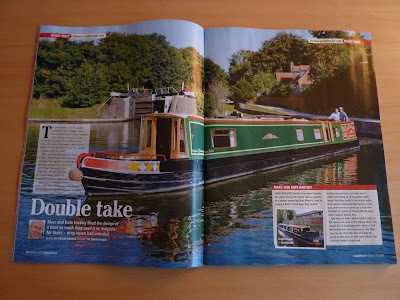 I managed to grab a quick picture, which also makes an appearance in the magazine.